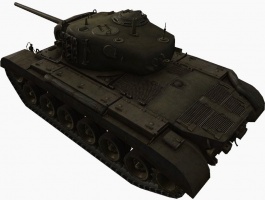 For the premium vehicle, see T26E4 Super Pershing. The M26 Pershing is an American tier 8 medium tank. American medium tank, named in honor of General John Pershing, who led the American Expeditionary Force during World War I. 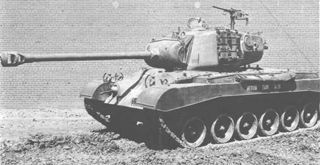 In 1944–1946 in the U.S. Army, the M26 was temporarily classified as heavy tank. Starting in February 1945 these vehicles took part in World War II; in 1950–1951 the vehicle saw combat in the Korean War. Compared to other tier 8 medium tanks, the Pershing's armor is quite solid and capable of bouncing low-tier guns. However, like all other medium tanks, it does not fare well on its own and will easily get destroyed if caught in the open by tank destroyers or heavy tanks. Therefore, it acts better as a mobile mid-range sniper or as support for heavier tanks. After you get the upgraded engine, the Pershing becomes much faster and can plug holes in whichever areas are needed. Its top gun is effective in the supporting role, but will find itself outclassed when fighting most heavies from the front. 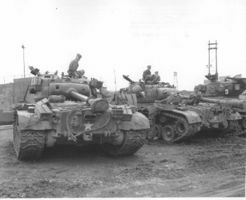 The M26 Pershing leads to the M46 Patton. 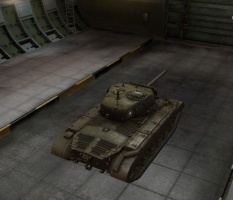 Easy grind (assuming you have unlocked the 90mm M3 on the T20). Armor is not thick enough to protect it from tanks around its matchmaking tier, although it is noticeably better than T20. Silhouette is large and can be destroyed easily if caught out in the open. A very solid tier 8 tank, the Pershing can excel as a support, flanker, sniper and is hard to dislodge in a hull down position. Just remember to use your brain when playing this tank - use superior mobility to outflank heavy tanks and TDs and superior terrain abuse to outplay your medium peers. Another note is the Pershing's extremely durable gun mantlet. Using hull down against most enemies is extremely effective due to the great gun depression, said turret durability and front placement of the turret, which allows most or all of the hull to be hidden under terrain in most situations. A Pershing in this position can become a formidable wall against numerous opponents. This vehicle begins the trend of soft stat monsters on the American Medium line. Though some things like its speed, power to weight ratio, gun accuracy and armor are not the best in its tier, it handles exceptionally well when driven with both a skilled player and a skilled crew. The gun is the most deceiving thing on the tank. Its mediocre accuracy on paper is enhanced by its great on the move accuracy and gun handling. The penetration is decent for a tier 8 medium tank. One of the best qualities of the cannon is its effective APCR ammunition; it can punch through the frontal plate of a Tiger II, IS-3, KV-4 or Jadgtiger even when the vehicle is angled thirty degrees. Because the M26 Pershing is decent at everything, it is bad at nothing. 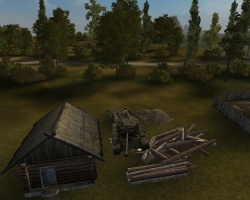 Use this to force more specialized tanks into situations where they are at a disadvantage. However, this could also put you into a situation where you are at a disadvantage, when the more specialized vehicles can engage you in situations they were designed for. Thus, its versatility can be a double-edged sword; allowing you to be adaptable but leaving you short when fighting specialized vehicles in their niche. Just like the majority of American mediums, the M26 can passive scout quite well. 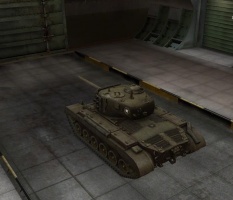 With 400m of view range, this tank is very adept at the job, especially when compared to other tier 8s. Use this to gain sight lines on key areas of the map. Top engine is shared with T25 AT and T25/2. For snipers/passive scouts, go with Improved Ventilation Class 2, Coated Optics or Binocular Telescope and Camouflage Net. Improved Ventilation Class 2 can be replaced by an Enhanced Gun Laying Drive if improved aim time is preferred or Medium-Caliber Tank Gun Rammer if increased fire rate preferred. Commanders should receive Sixth Sense and Recon or Eagle Eye. Gunners should receive Deadeye and Designated Target. Driver should receive Repairs and Preventative Maintenance. Radio Operatiors should receive Situational Awareness and Signal Boosting. Loaders should receive Repairs and Safe Storage. All crew should receive Camouflage for the third skill. 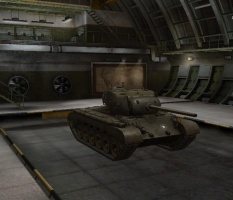 For brawlers/flankers, go with Improved Ventilation Class 2, Medium-Caliber Tank Gun Rammer and Vertical Stabilizer. The Improved Ventilation Class 2 can be replaced by an Enhanced Gun Laying Drive if better shoot-and-scoot performance is desired. Radio Operator should receive Repairs and Situational Awareness or Signal Boosting. All crew should receive Brothers in Arms for the third perk. The M-26 was developed near the end of World War II and named after World War One General John J Pershing of the American Expeditionary Force. The M26 Pershing had a slow and arduous beginning, when the need for a heavy tank was not in the priorities of the US Army. Instead, efforts were relegated to production of M3 Stuart Light Tanks and M4 Sherman Medium Tanks. It was not until the debut of the German Panther and Tiger series of tanks on the battlefields of Europe that the need for a heavily-armed, and armored, weapons system came to bear. Considerable effort was then made to develop a gun system capable of competing with the German counterparts. The result was the M26 Pershing armed with a 90mm main gun (nearly on par with the German '88') and heavily armored overall. It was the closest weapon that the Allies would field that was akin to the German Panther, in terms of firepower and crew survivability. 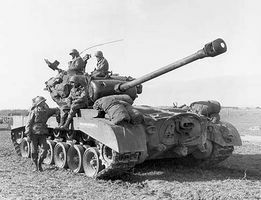 The M26 Pershing arrived too late to be of any effective use (overall) in the European Theater, but a few (roughly 200) saw service with the 3rd and 9th Armored Divisions. At least 100 were kept in reserve as well. The mammoth M26 Pershings would be part of the armored column that would cross the Remagen Bridge over the Rhine River and into Germany with the 9th Armored. About 20 M26s were reported to have seen any action at all. Ten M26s were also shipped out to the Pacific Theater for action in Okinawa, though arriving too late to be of any effective tactical use. This was not the end of the line for the M26, however, as a total of 309 M26 Pershings were rushed to Korea in 1950 to provide extra firepower to counter the T-34/85s. A 1954 survey concluded that there were in all 119 tank vs. tank actions involving U.S. Army and Marine units during the Korean War, with 97 T-34-85 tanks knocked out and another 18 probable. 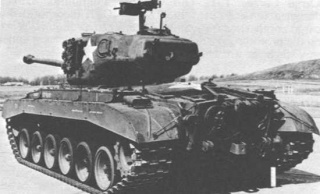 The M4A3E8 was involved in 50% of the tank actions, the M26 in 32%, and the M46 in 10%. The M26/M46 proved to be an overmatch for the T-34-85 as its 90 mm HVAP round could punch all the way through the T-34 from the front glacis armor to the back, whereas the T-34-85 had difficulty penetrating the armor of the M26/46. 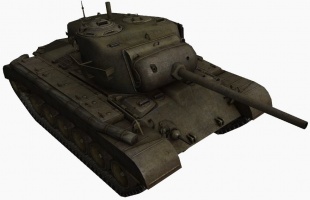 The M4A3E8, firing 76 mm HVAP rounds which were widely available during the Korean War (unlike World War II), was equal to the T-34-85 as both tanks could destroy each other at normal combat ranges. 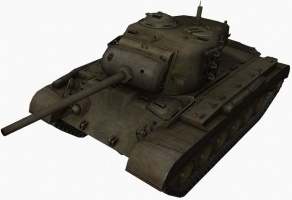 Although the M26 proved effective against the armour of the T-34/85s, the automotive deficiencies of the M26 in the mountainous Korean terrain became more of a liability, and so all M26s were withdrawn from Korea during 1951 and replaced with older up-gunned M4A3 Shermans and the newer M46 Pattons. Post-war use saw a great number stationed throughout Europe with NATO through the Cold War, however, many were quickly replaced when the more reliable M46 Patton became available. Many alternative variants were devised, though some, like the self-propelled gun platform, not used by the US Army. The M26 Pershing would later be reclassified as a Medium Tank and become the blueprint for tanks such as the M46, M47, M48 Patton, and M60 Main Battle Tanks. 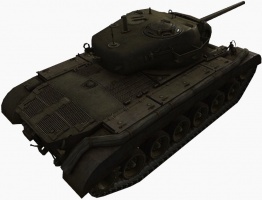 In 1948, the M26E2 version with a new more powerful and reliable engine and transmission became the M46 General Patton, which in turn was up-gunned and modified resulting in the M47 and eventually the M60 patton. 9th Armor Division M-26 Pershing Heavy Tank photographed near Vettweiss, Germany in March 1945. * Top gun T15E2M2 is fictitious. M26 Pershing was armed with 90 mm Gun M3. 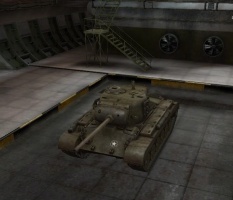 Variants upgunned with experimental T15E1/T15E2 were known as "SuperPershings". Historical Ford GAF (450–500 hp) engine is not available even in stock configuration. This page was last modified on 16 March 2019, at 20:28. This page has been accessed 616,771 times.